HomeAntibiotic surgical prophylaxis: stewardship’s ‘elephant in the room’? Antibiotic surgical prophylaxis: stewardship’s ‘elephant in the room’? We are all pretty comfortable with the idea that we have used too many antibiotics in the past and now we are reaping the consequences. I think we are also all in agreement that we need to start using antibiotics much more rationally – and keep the big guns firmly on the top shelf, double-wrapped in password-protected packaging that you can only access with a fingerprint and retinal scan (whilst acknowledging that they will still somehow be prescribed by a junior doctor at 3am for a sniffle). But I get the feeling that we all have a bit of a blind spot (or soft spot) for surgical prophylaxis. Here, the situation is different, surely, because the consequence of an SSI is so great that the likely ‘cost’ of widespread surgical prophylaxis is outweighed by the gain of fewer SSIs? But has this become stewardship’s elephant in the room? We are comfortable talking about restricting carbapenem use in acute hospitals, but I don’t hear as much discussion about stopping the use of antibiotics for surgical prophylaxis! On one level, isn’t this is the same arguments as for ‘selective’ digestive or oral decontamination (SDD / SOD) in the ICU? Here, the argument in factor of SDD / SOD is compelling: fewer deaths and less spread of resistant bacteria. 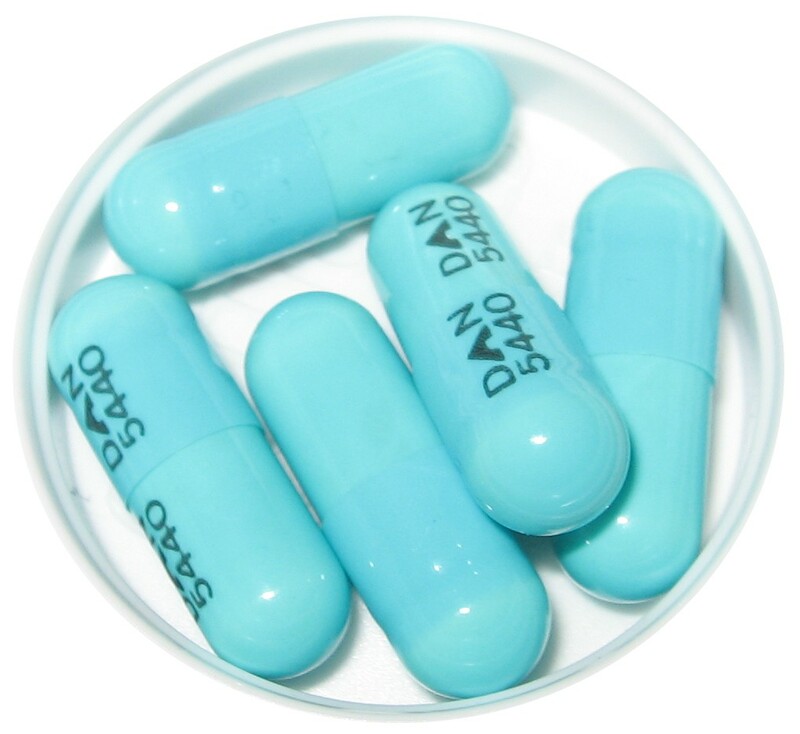 But indiscriminate use of antibiotics, which is bound to fuel antibiotic resistance in the long run, just cannot be a good idea, particularly in the high-risk ICU population. And so to a recent publication in the Journal of Medical Microbiology from Peter Hawkey’s group in Birmingham about antibiotic surgical prophylaxis and antibiotic resistance. The study included daily sampling of the nose of 63 hospital inpatients who had received antibiotic surgical prophylaxis compared with 16 patients who had received no antibiotics. There was a broad coverage of prophylaxis approaches, covering six different regimes over 4 surgical specialties. Antibiotic surgical prophylaxis was associated with a small decrease in the total bacterial count in the nose, a more pronounced reduction in S. aureus, and, unsurprisingly an increase in antibiotic resistance among staphylococci. 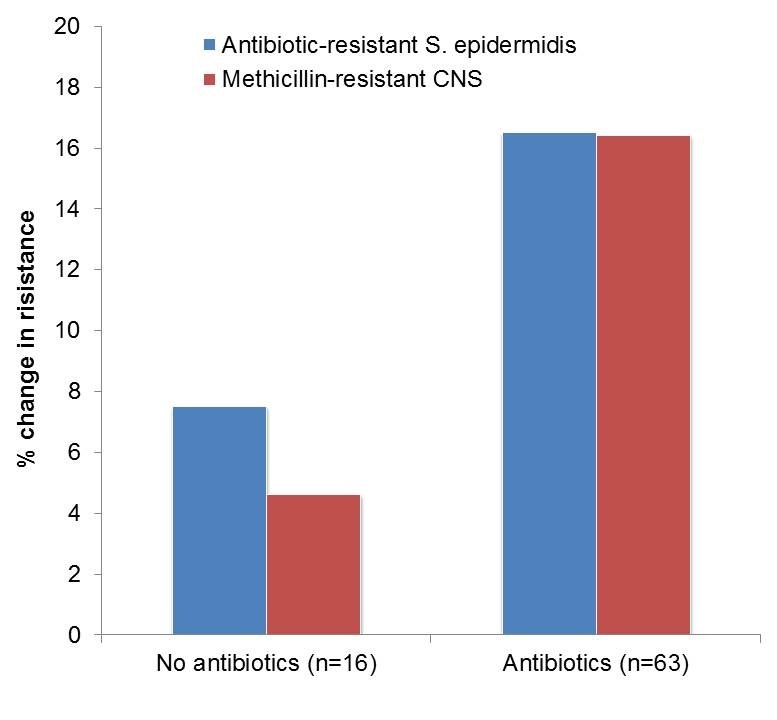 The proportion of S. epidermidis resistant to antibiotics increased by 16.5% for patients given antibiotics and by 7.5% for those not treated by antibiotics (see Figure, below). Similarly, the proportion of coagulase-negative staphylococci (CNS) resistant to methicillin increased by 16.4% in the antibiotic-treated patients compared with 4.6% in those patients who did not receive an antibiotic. (I suspect the apparent increase in carriage of antibiotic resistant S. epidermidis had to do with “unmasking” of resistant strains that were present all along combined with some cross-transmission.) The sample size was a little small (especially the ‘control’ group), meaning that most of the differenes identified were not statistically significant, and there was no randomisation involved. Nonetheless, this neat study highlights the potential for antibiotic surgical prophylaxis to generate / select for resistant bacteria. Figure: Increases in the proportion of patients with antibiotic-resistant staphylococci cultured on day 1 compared with day 3. Could it be that surgical techniques could be designed to be less ‘SSI-prone’, but this has not been fully explored due to the ‘safety net’ of antibiotic surgical prophylaxis? We do what we can to reduce the impact of antibiotic surgical prophylaxis by using a single dose in most cases, and choosing antibiotics that are least likely to drive resistance. But, I fear we may find ourselves in a position in the not too distant future where antibiotics are reserved only for treating infections – and surgical prophylaxis certainly does not meet this fundamental criterion! Firstly we promoted use of antibiotic to prevent SSI slowly and gradually this protocol accepted by physicians now taking U turn again take off effort and time until that time world may too late. Hi there I know this would be a difficult message to manage – but the more I think about antibiotics for surgical prophalyxis, the more uncomfortable it seems! Hi Jennie yes I’m sure this is true! Useful link to the ECDC report – thanks. What, if we had a safe solution to disinfect effectively the surgical site by irrigation before wound closure instead of admistering antibiotics prophylactically? Look no further, there is a solution available, which has even been used in open heart surgeries (http://www.ncbi.nlm.nih.gov/pubmed/?term=electrolyzed+water+surgery). This silver bullet is available from Oculus Innovative Sciences (http://oculusiseu.com/), see wound care along with Epicyn, a hydrogel for scar management you can apply immediately after suturing the wound, which is anti-inflammatory and anti-microbial. More than 5 million patients have been treated with their Microcyn™ technology without a report of a single adverse effect. Note: I am not working for Oculus, I am just their Swiss distributor for their dermatology products. But I just have to advertise them, now that we found bacteria resistant also to colistin.